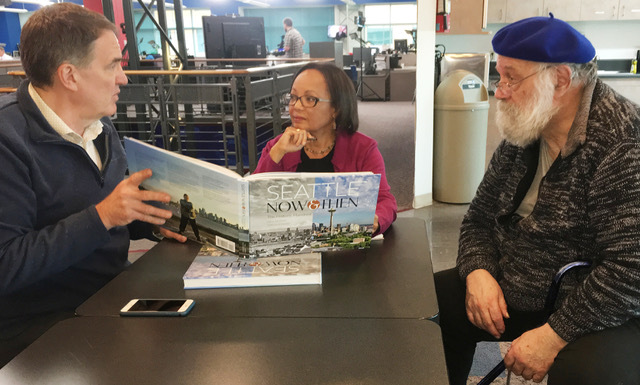 Photographer Jean Sherrard, KOMO TV-4's Connie Thompson, and local legend Paul Dorpat will discuss their new coffee table book Seattle Now and Then at the Southwest Seattle Historical Society annual gala Nov. 3 at Salty's on Alki. The Southwest Seattle Historical Society is looking forward to seeing supporters and community members this coming Saturday, November 3, 2018 at 11 am at Salty’s on Alki. The special guests this year are Paul Dorpat & Jean Sherrard of the Seattle Times “Pacific NW Magazine” column, “Seattle Now & Then,” which, each week, features an historical photo of a building or place in Seattle matched with the modern photo taken by Jean Sherrard from the same vantage point, and coupled with the poetic language and wit that Paul Dorpat has been famous for, for over 37 years. The Gala marks one of the very first public appearances by the pair with their newly-released book, “Seattle Now & Then: The Historic Hundred.” Connie Thompson of KOMO4 will provide an insightful interview of the pair, and at the end of the event Paul & Jean will sell and sign a copies of their book. Our own board member and 4th great grandson of Chief Sealth, Ken Workman (who happens to be featured in the book as well) will honor us at the beginning of the program by speaking about his ancestral connection to the land and to the trees within our area. We will then have an amazing set of auction items, including art, getaway experiences, and great restaurants and local services in a great segment we call “Fun in the Junction,” as well as a book signing by Paul Dorpat and Jean Sherrard at the end of the event. Also featured is the “Golden Ticket” drawing that features a “Choose Your Cruise” opportunity to win a trip to one of five destinations offered by Holland America Line. Note: Tickets are available at the easy-to-access web domain: galatickets.org — we recommend that you purchase your tickets online or contact Jeff McCord at 206-234-4357 to arrange another form of payment. I grew up in Highland Park during the 1940's and into the 50's. I wrote a small article about it with pictures. Would you like a copy to review for a possible feature? Sure. Send it to us.